This week's theme is Writing Workshop and I wanted to share some of my ideas for incorporating writing in the classroom. I don't do a specific Writing Workshop Curriculum in my fifth grade classroom, but we do emphasize the many intricate, cyclical steps of the writing process! Aren't these cute? I got them at the Dollar Tree - aka my "home away from home"
One cool thing that we use that walks the students through the writing process step by step is from "Really Good Stuff"
I like it because it keeps all of their work in one place and allows them to move back and forth between the stages of the writing process and includes important checklists and rubrics. I LOVE to have my kids journal - but I like to do it guided (with prompts). This helps them get started and stay focused. Occasionally they have a "free write" but I find it sometimes overwhelming for kids. The summer before my first year of teaching, I spent hours making tons of writing prompt centers. 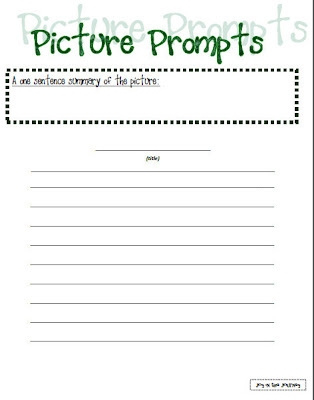 I have everything from seasonal writing prompts to a "title grab bag" to "a day in the life of..."
One of the most fun things I've done recently is given the students a "Picture Prompt" and then let their imaginations run wild! I recently bought an "Outdoor Adventure" calendar from the clearance section of Michaels for 29 cents (what a bargain!). I displayed the picture and had the students study it. They recorded their observations using the "5 Ws." Then they planned their short story (by writing details for the beginning, the middle, and the end). 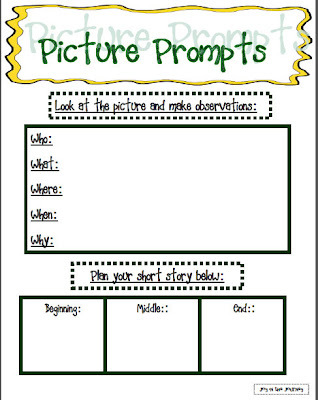 Then, using their observations and imaginations, they wrote a short story to accompany the picture. The kids LOVED it! I plan to do it again soon. This gave the kids the opportunity to practice recording observations and noticing details, pre-writing, and drafting their ideas. It uses both sides of the brain - the analytic side and the imaginative side. 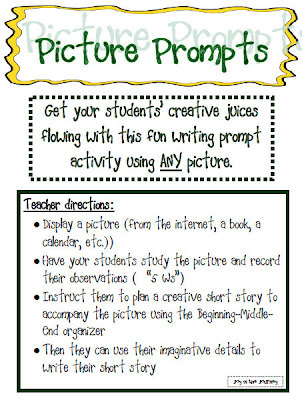 Because it worked so well in my class, I want to give you the opportunity to try it with your kiddos. I love teaching writing - assigning the prompt, getting kids excited about what they're going to be writing about, showing/reading them examples, doing pre-writing flowcharts and graphic organizers, etc. But then when it comes to revising and editing sections - I really don't enjoy that part. I don't have a good method for guiding my students through these steps and holding them accountable for making adequate changes. I have them peer-edit, but so often mistakes get over-looked. I have tried meeting with each student for a one-on-one conference, but I am not good at prompting them to fix things on their own. My temptation is to revise it for them rather than letting them take ownership of the process..
Don't forget to link up with Jivey for her Workshop Wednesday and share your writing tips! ALSO! 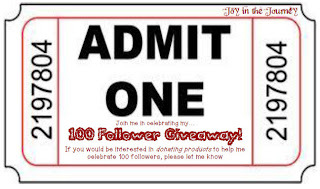 There are only a few more days left to enter my 100 Follower Giveaway! Check it out for your chance to WIN lots of great products!